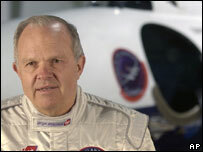 Images from Google Earth are being enrolled in the search for adventurer Steve Fossett. 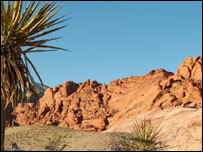 Many people are scouring up-to-date satellite images of Nevada to try to spot Mr Fossett's downed plane or wreckage. The project is being co-ordinated via Amazon's human-powered problem solving scheme called the Mechanical Turk. It comes after a frustrating weekend in which searchers failed to turn up any sign of Mr Fossett. Mr Fossett went missing on 3 September after taking off in his single-engine Citabria aircraft from the Flying M Ranch near Yerington, Nevada. The trip was supposed to last a maximum of three hours. The search for Mr Fossett or his downed plane covers 44,000 sq km (17,000 square miles) of Nevada's wilderness as well as parts of California. In a bid to help searchers focus their efforts, Google released up-to-date images of Nevada for the search giant's Google Earth software. Following the release of the images, Amazon created a collaborative search scheme run via its Mechanical Turk system. The Mechanical Turk pays people to perform tasks that computers would struggle to complete, such as translating text or evaluating images. Anyone taking part in the Mechanical Turk scheme downloads the updated images and an associated program that shows them recent images that they can flag if any appear to be candidates for a crash site. The creators of the search scheme said Mr Fossett's plane would appear as an object about "21 pixels long and 30 pixels in wingspan". Flagged images will be passed on to the search team co-ordinating flights over the area where Mr Fossett is thought to have gone missing. Talking to reporters, Nevada Civil Air Patrol Major Cynthia Ryan welcomed the help but said it was unlikely that Google Earth would have picked up anything that military satellites would not spot. The search in Nevada by the Civil Air Patrol and many private pilots has discovered six previously unknown wrecks - some of which were decades old. The 63-year-old adventurer reportedly took the flight to look for locations that could be used for an attempt on the land speed record. During his life, Mr Fossett has racked up about 100 world records. In March 2005 he became the first to fly a plane solo, non-stop around the globe.